Smiles abound in this design! Great for family, friends, loved ones, or for just about anyone. Wrapped in crisp clear cellophane and topped off with a handmade bow. Silk roses & greenery are added. Includes a Handwritten Greeting Card. Finished wrapped design for hand delivery, approx. 20H" x 12W" x 7" D (Large container 9.5"L x7"d x6"h). 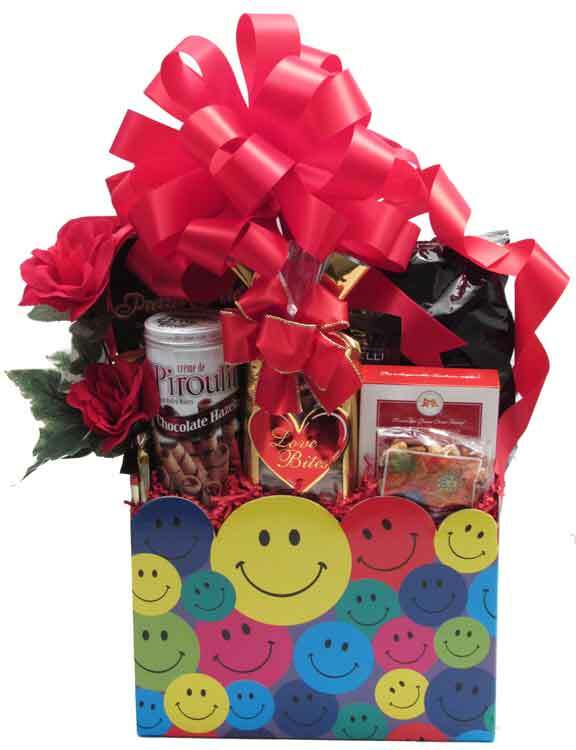 Add a smiley face balloon and/or a red heart shaped balloon to bring a smile to their day! MORE SWEET THAN SAVORY: Filled with Nuts, box of creamy Chocolate Truffles, "Love Bites" Snack Mix made in Texas!, Ghirardelli Chocolate Squares, Cheese Straws, Chocolate filled Creamy Dark Chocolate filled Butter Wafer Cookie, White Chocolate Amaretto filled Butter Wafer Cookie (cookies made right here in Dallas! ), Pretzel Twists (Smoky Barbeque, Cheese Pizza, or Salted Caramel), Gourmet Popcorn made right here in the Dallas area! (Almond Pecan Crunch, Cranberry Walnut Crunch, Dark Chocolate with Sea Salt Crunch, or Caramel & Cheddar Jalapeno Crunch), and a box of Peanut Brittle. NOTE: Let us know in the special instructions section at check out, if you prefer "I'm Nuts For U Valentine" Snack Mix instead of "Love Bites". A BIT MORE SAVORY THAN SWEET: Filled with Nuts, Cheese, box of creamy Chocolate Truffles, Cheese Straws, Chocolate filled Creamy Dark Chocolate filled Butter Wafer Cookie, White Chocolate Amaretto filled Butter Wafer Cookie (cookies made right here in Dallas! ), Pretzel Twists (Smoky Barbeque, Cheese Pizza, or Salted Caramel), Natural Hickory Smoked Sliced Beef Summer Sausage, Gourmet Popcorn made right here in the Dallas area! (Almond Pecan Crunch, Cranberry Walnut Crunch, Dark Chocolate with Sea Salt Crunch, or Caramel & Cheddar Jalapeno Crunch), and a box of Focaccia Crisps Crackers.